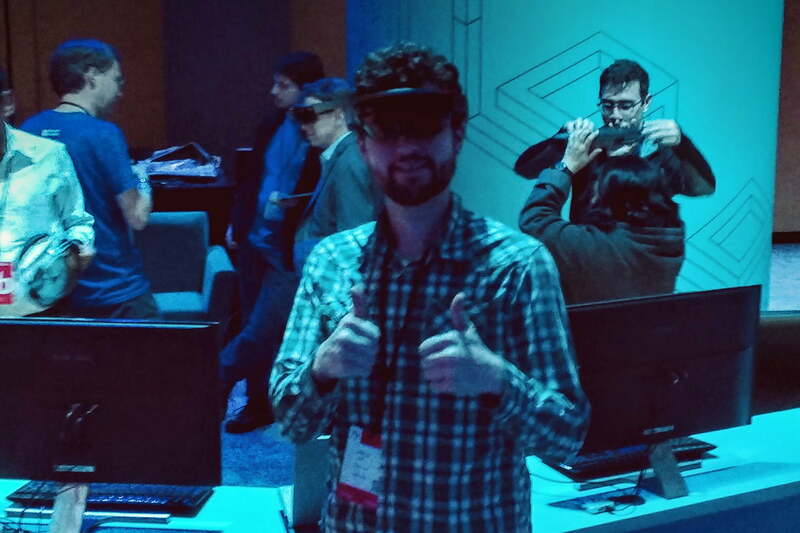 I was lucky enough to find myself first in line to try Microsoft’s HoloLens at this year’s BUILD session. As the doors opened, I found myself greeted not by a small, dimly lit room, but a large hall with chairs to seat me and the fifty-odd people behind me all at once, together. Music blared, party lights blazed, and the HoloLens developers took to their feet, stomping and clapping to a ground-shaking techno beat. HoloLens could really use something to hold on to. This is not normal. Past demos of augmented or virtual reality – including those from Microsoft – have happened under strict, self-important secrecy, as if the experience was a grand privilege that might be revoked at the slightest provocation. BUILD 2016 flipped that script, putting everyone in a wide open room full of pleasant “mentors” from the HoloLens team, who seemed ecstatic to have people see what they’ve been working on. If only excitement was enough. The HoloLens is cool, but with the Rift out and the Vive around the corner, AR and VR headsets are now real products anyone can buy. 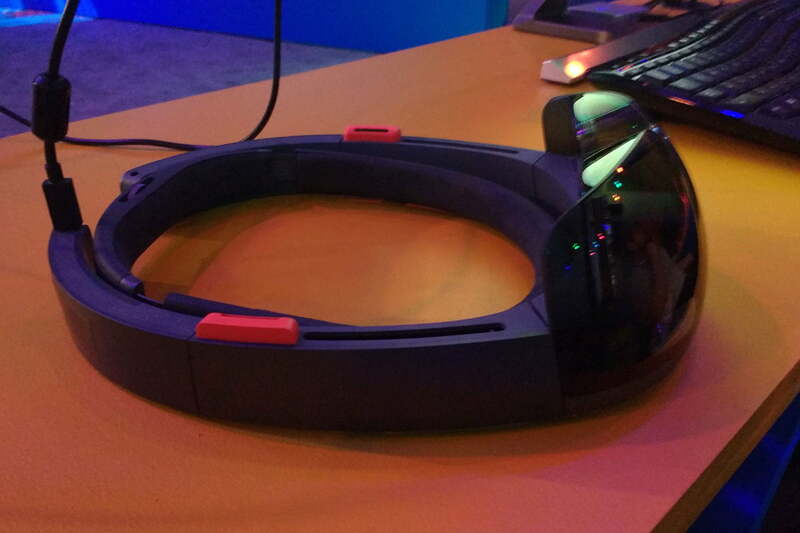 And Microsoft still has some work to do if HoloLens hopes to compete. This demo marks the fourth time the Digital Trends team has tried HoloLens, and the second time I have myself. Each time we’ve said the headset’s limited field of view is a problem. But this time, in particular, it felt crippling. In videos, the holographic experience looks all-encompassing. When you put on the headset, though, you can only see through a postcard-like window. Its size is hard to describe, but I’d guess it about the size of my hand when held, flat-palmed, a foot away from my face. Your mileage may vary. During my previous HoloLens demo, which took place in a small room where I couldn’t move far, this limitation was annoying, but acceptable. In a large room full of people moving about, it was much worse. Microsoft’s demo focused on interaction with others, but the HoloLens’ field of view is so small that it’s difficult to see holograms near a person while standing at the distance you’d normally converse. Yes – the field of view is that small. Later, I shot bullets that bounced dynamically of the surface of real-world objects that were mapped by the HoloLens’ sensors. It was fun, but I found it almost impossible to track them for long within the headset’s small window. I eventually decided to just shoot at a nearby wall, where the projectiles would simply bounce back. Exciting? Not really. But at least I didn’t have to jerk my head around like an owl. The release of the Developer Edition has of course left geeks like me in eager anticipation of the full version. When will it arrive? This summer? By Christmas? Midway next year? From what I saw, I’d put my money on the latter. In some ways, the hardware seems ready for stores. It looked slick, felt fairly comfortable, was simple to adjust, wireless, and capable of networking with other HoloLens headsets. The interface was improved over previous demos with a new home screen and a self-guided setup process that negated the need for the inter-pupillary distance measurement required before. But it didn’t always work right. People in my group had syncing problems between our headsets, at first, and one person in my group didn’t sync up with the rest, prompting some emergency assistance from our appointed mentor. The room-mapping featured also proved scatterbrained. In theory, the headset can precisely map a user’s surroundings to make real-time interaction with holograms and the environment possible. In practice, the room maps appeared low-resolution and were often inaccurate. This lead to holograms floating where they should not have, or sinking into furniture. Such bugs didn’t occur all the time, but they were frequent enough to be distracting. Holograms also have a tendency to overlay objects in the foreground, including the user’s own hands. This led to some bewildering depth perception issues, which wasn’t helped by the fact holograms can appear quite real. Like the mapping issues, it’s not a constant problem, but it’s impossible to miss when it happens. At one point near the end of my demo I found myself looking down a holographic cavern in the floor, shooting at cute robots by flicking my fingers at them. That’s the moment I realized theHoloLens could really use something to hold on to. The lack of controller means there’s no tactile relationship between your hands and the holograms. Currently, they don’t react to being directly touched or poked. They only understand specific gestures like the “air tap,” which involves holding your index finger straight up, then quickly closing it into your fist. A disconnect results. You can see the holograms, and even hear the holograms (the built-in audio is pretty decent), but interaction is limited to a few understood gestures, and you don’t receive a tactile response. The holograms reveal themselves to be imaginary, and suspension of disbelief is broken. I know this is harsh. 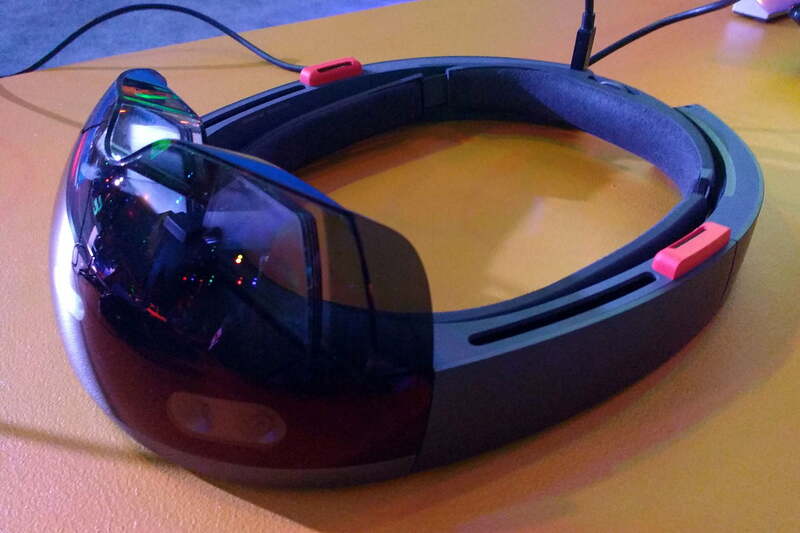 The HoloLens has received much praise so far, and it’s exciting technology. I actually feel bad pointing out its flaws. The developers behind it are the most enthusiastic I’ve ever met. I’ve never met developers more excited than those working on HoloLens. But I can’t pretend that what I saw felt anywhere near finished. The HoloLens may still become a world-changing technology, but that change is not going to happen this summer, or even, most likely, later this year. Having recently used the Vive, I can attest that the gap between it and the HoloLens is enormous. The Vive is a cinch to set up, feels more natural in use, and has a handful of immediately available, complete, enjoyable experiences. I’m not saying the HoloLens is doomed. But it’s telling that Microsoft is so restrictive with its dev kit, and limiting real-world to large companies and organizations before a consumer release date is even teased. Microsoft has shown playful demos featuring Minecraft and other games, but the HoloLens is currently more tool than toy, and I don’t think that focus will soon shift.